My rating: 8.5/10. Very good watch. Oversized design. Today I’m doing a Fossil JR1401 review. This Fossil watch is part of the Nate collection that focus on these brilliantly designed oversized watches with a brilliant mix of bold styles. Fossil has been creating quality timepieces since 1984 and continues to offer great value for money whilst keeping to their high design standards. 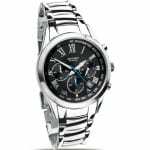 You’ll see from this detailed Fossil JR1401 review just how good this timepiece is and if it’s suitable for you. You should also check out my best 100 watches under £500 next. I’m just quickly going to point out some of the main specifications for this JR1401 review. These are the features people like to get a quick grasp on before going into more detail. The JR1404 Nate edition watch is clearly a popular watch. 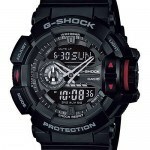 A best seller on quite a few watches sites primarily due to its popular all-black design and oversized style. In recent years oversized watches have become very popular, as have all black watches, so a blend of the two was bound to go down well. Fossil are known for the high-quality watch builds and this is the exact quality you can expect from them. Below we’ll take a look at the different aspects of the watch in more detail. If you look closely at the dial of the JR1401 you’ll spot its interestingly designed textured matte black finish. I’m a big fan of textured dials so love to see this type of feature on a watch. It allows you to differentiate from the hands and Arabic style grey numerals much easier. I also really like how the chronograph dials are all neatly tucked together unlike other chronograph watches where they seem to try and take up as much space as possible. There is also a handy date display featured on the dial and due to its white numerals is instantly recognisable which is a good touch. 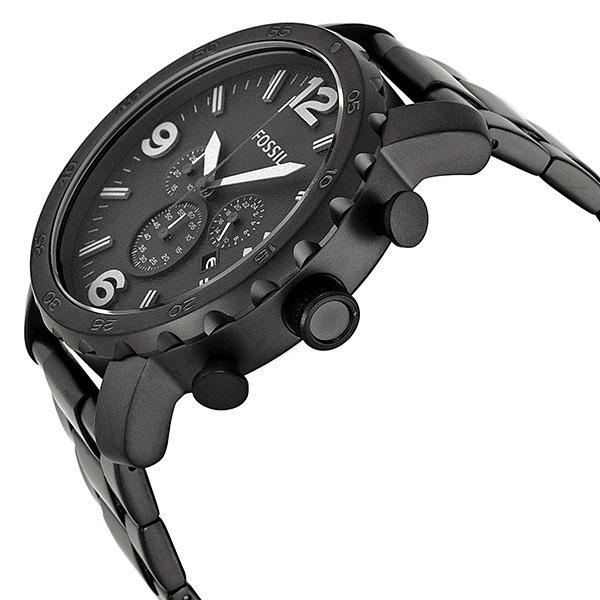 I mentioned in the intro that this watch from Fossil has an oversized style to it. Some people really love oversized watches, the bigger the better. But sadly they aren’t for everyone as some people with smaller wrists find they aren’t overly suitable for them, so this is worth keeping in mind. The casing diameter of this model is 50mm which definitely puts it in the extra large category. The thickness of the casing is 13mm so while it does have a fairly large profile it avoids being too chunky. 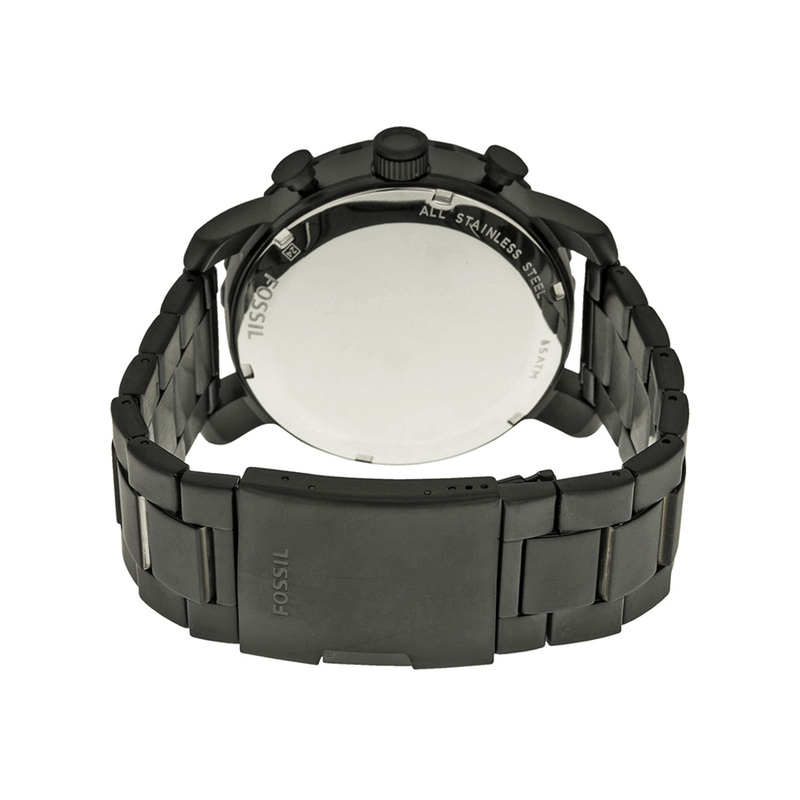 With a high-quality mineral glass crystal, this watch can withstand a fairly good level of scratching. Mineral glass is considered scratch resistant, whereas sapphire crystal which is more expensive is classed as scratch proof. At this price point, I’d say it’s fair to expect mineral glass in this watch as sapphire tends to come in more expensive watches. The strap features a single sided push button deployment clasp, which is a style I rather like myself. Like the rest of the watch it’s black ion plated giving it this cool finish. It’s made of stainless steel and has a width of 24mm that’s slightly larger than average but perfectly suited for the oversized dial design. The thing with water resistance testing is that it’s done in a still environment with no added pressure. So 50m resistance doesn’t mean you can take it 50m deep. The very motion of moving your arm would increase the pressure forced upon a watch greatly from that that it would experience just submerged. This JR1401 watch features a Japanese Quartz movement. It’s fair to say that Quartz movements are fairly common, mainly due to their great accuracy and affordable cost. They work by synchronising a quartz crystal with an electronic oscillator. The electric current then causes the quartz to pulsate at a precise frequency which gives you this great accuracy for a modest price. For those of you who prefer to just check out a quick pros and cons list, here’s ours for this JR1401 review. Oversized watches such as this one aren’t always suitable for people with smaller wrists. Some people may find this style of all black design on the dial hard to read, personally, I have no issue with it though. 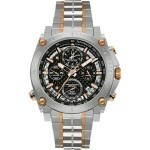 If you love all black watches or oversized timepieces then this watch really could be ideal for you. 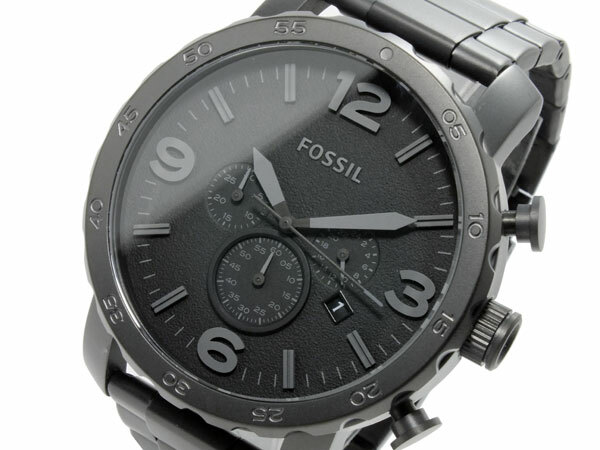 Fossil make some really great quality timepieces and in my opinion, this offers very fair value for money. I just love the textured detailing on the dial and I’m a sucker for oversized watches so it’s great for someone like me. Overall I quite enjoyed taking an in-depth look at this watch for the Fossil JR1401 review. Having taken a look at the design, build quality, features, materials, and pricing I gave this watch an 8.5/10 from us at The Watch Blog. I hope you enjoyed having a read through of this extensive Fossil JR1401 review. As always let us know in the comments section below what you thought of this watch.